The sanctuary service "was the most wonderful object lesson every given to mankind". Drawing solely from Scripture, Stephen Haskell gives you a clear, concise understanding of how the Old Testament sanctuary captures the entire theme of the gospel and represents the work of Christ in our behalf today. You’ll learn how each facet of the sanctuary and its services, the different offerings and feasts, and the work of the high priest directly illustrate your personal salvation through Christ. "In the sanctuary, the cross of Christ is the great center of the whole scheme of human redemption. Around it clusters every truth of the Bible" (p.ix). Stephen Nelson Haskell (1833–1922) was an evangelist, missionary and editor in the Seventh-day Adventist Church who became one of the pioneers of the Seventh-day Adventist Church in the South Pacific. 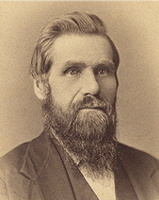 Stephen Haskell began preaching for First-day Adventists in 1853, but the same year, after reading a tract on the Sabbath, he became a Sabbath keeper at the age of 20. Following some years in self-supporting work in New England, he was ordained in 1870 and became president of the New England Conference, serving from 1870 to 1887. While in that position, he served three times president of the California Conference (1879–1887, 1891–1894, 1908–1911) and also of the Maine Conference (1884–1886). In 1885 Elder Haskell was in charge of the first group of Seventh-day Adventist missionaries who went to open the work in Australia. Together with two other Adventist preachers, John Corliss and Mendel Israel, he helped start the Signs Publishing Company first began as the Echo Publishing Company, in North Fitzroy, a suburb of Melbourne, which by 1889, was the third largest Seventh-day Adventist publishing house in the world. He also founded South Lancaster Academy (now Atlantic Union College) in 1882. From 1889 to 1890 he traveled to many parts of the world on behalf of Adventist missionary work. His wife died in 1894, and in 1897 he remarried to Hetty Hurd and with her did evangelistic and Bible work in Australia and the United States. He also authored several books including: The Story of Daniel the Prophet, The Story of the Seer of Patmos, Bible Handbook and The Cross and Its Shadow. Elder Haskell died in California in 1922. This book is simply written. I did not understand the sanctuary doctrine about the earthly sanctuary that God had Moses build as compared to the heavenly sanctuary Stephen Haskell wrote this book so simply that I understood. Praise God for inspiring Stephen Haskell to write this wonderful book! For years I had difficulty understanding what happens in the heavenly sanctuary and how it relates to me. The author verifies everything with Biblical texts. I so appreciated that. He also explained it in a way that the average person could understand. Excellent book! !